March is a sensitive month for Tibetans because it is full of days that mark important and emotional historical changes since March 10, 1959. March is also a sensitive month for China, the fantastic drama of the so-called “Liang Hui” (Meeting of the National People’s Congress and Chinese People’s Political Consultative Congress) takes place once a year in this month. A cartoonist who mocks the autocracy, caricatured those in power by drawing them with particularly long noses; we all know that this is a symbol for liars. At this fantastic drama, representatives from “national minority groups” and “religious organisations” are indispensable figures, all acting as decorative “pretty vases”. That is why on TV and in newspapers we see the colourful and bright members of “national minority groups” and “religious organisations” decorating the scenery of the flourishing empire. The very same kind of scenery already existed in the former Soviet Union. Some “minority” representatives had, however, changed into fashionable suits and shiny leather shoes, also wearing sophisticated looking glasses, which were to demonstrate that they kept up with recent trends, but whatever these people said it was wrong; wrong to an extremely vulgar extent, that they became a laughing-stock. 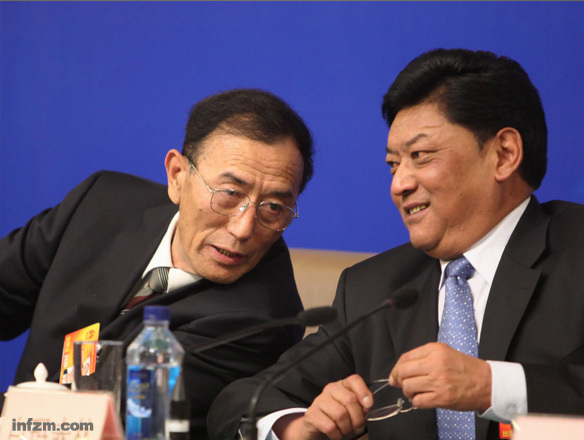 Especially noteworthy is the interview that the slightly less government oriented “Southern Weekend” carried out with two “Liang Hui” representatives: Jampa Phuntsog, Chairman of the Standing Committee of the People’s Congress of the Tibet Autonomous Region and Pema Thinley, the head of the Tibetan Autonomous Region. The increasingly government friendly Hong Kong TV station, Phoenix, also interviewed Jampa Phuntsog. Even though the reports all appeared after the “Liang Hui” had finished, they were typical for the meeting and full of lies. These statements don’t require further analysis, I just wanted to note them here and let people make sense of them for themselves. As soon as these words had been spoken, they caused immediate uproar. In fact, this passage serves as a perfect example for a study on the relationship between centralised political power and religion.